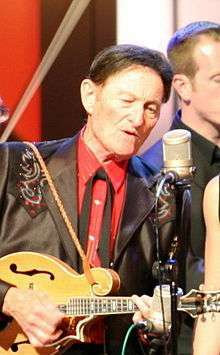 Jesse McReynolds at the Grand Ole Opry in 2007. Jesse Lester McReynolds (born July 9, 1929) is an American bluegrass musician. He is best known for his innovative crosspicking and split-string styles of mandolin playing. He has been a member of the Grand Ole Opry since 1964 and is a multiple Grammy nominee and award winner. Jesse McReynolds was born in Coeburn, Virginia. He and his brother Jim begin performing together  in or around 1947. They originally performed under the name, "The McReynolds Brothers." In 1951, Jesse and Jim, joined by Larry Roll on guitar, made their first recording, ten gospel songs for Kentucky Records under the name "The Virginia Trio". In 1952, Jim and Jesse signed with Capitol Records, who asked them to change their name from the "McReynolds Brothers," so they started recording under the name "Jim and Jesse and the Virginia Boys.". They recorded 20 songs for Capitol over three sessions in 1952, 1953, and 1955. During this time (1952-1954), Jesse also served in the US Army in Korea (the 1953 recording sessions took place while he was on leave). While serving in Korea, he and Charlie Louvin of the Louvin Brothers (who was also serving in Korea) formed a band called the "Dusty Roads Boys" and played regular concerts for other troops. After Jesse's return from Korea, Jim and Jesse continued to perform and release albums until Jim McReynolds's death from cancer in 2002. Since 2002, Jesse has continued to perform and record as a solo artist. McReynolds plays between 60 and 70 shows each year. He regularly releases albums, both of bluegrass music and of other genres, playing both mandolin and fiddle. Bending the Rules nominated for "Best Instrumental Recording of the Year" from the International Bluegrass Music Association in 2005. 1951 The Virginia Trio 1951: Their Early Gospel Recordings (Old Dominion, 2000); Sacred Songs of The Virginia Trio (Ultrasonic) The Virginia Trio or James and Jesse McReynolds with Larry Roll Ten songs originally recorded as singles for the Kentucky label, later released as a single album by Ultrasonic and Old Dominion. 1952,1954,1955 20 Great Songs by Jim and Jesse (Capitol, 1968); First Sounds: The Capitol Years (2002); Jim and Jesse: 1952-1955 (Bear Family, 1992); Jim and Jesse: Best of the Early Years (Cleopatra, 2009) Jim and Jesse The duo recorded 20 songs for Capitol in three sessions. These songs have been released under various album names (not all albums listed include all 20 songs). 1993 Honor the King of Country Music, Roy Acuff (Old Dominion, 1993) Jim and Jesse This album is sometimes referred to as "Tribute to Roy Acuff"
↑ Erlewine, Stephen Thomas; Vinopal, David. "Biography: Jim & Jesse". AMG. Retrieved 18 May 2010. 1 2 3 4 5 6 Statman, Andy. Bluegrass Masters: Jesse McReynolds. Oak. ↑ Louvin, Charlie; Whitmer, Benjamin. Satan is Real: The Ballad of the Louvin Brothers. Igniter. ↑ "jimandjesse.com". Retrieved October 31, 2015. 1 2 3 4 5 6 7 Liner notes for "Old Dominion Masters," 4 album set released by Old Dominion and Pinecastle Records in 1999. ↑ "amazon.com". Retrieved October 31, 2015. ↑ "allmusic.com". Retrieved October 31, 2015. ↑ "jimandjesse.com". Retrieved July 25, 2015.